This secluded resort on a small, beautiful beach offers a truly tropical Koh Rong experience. 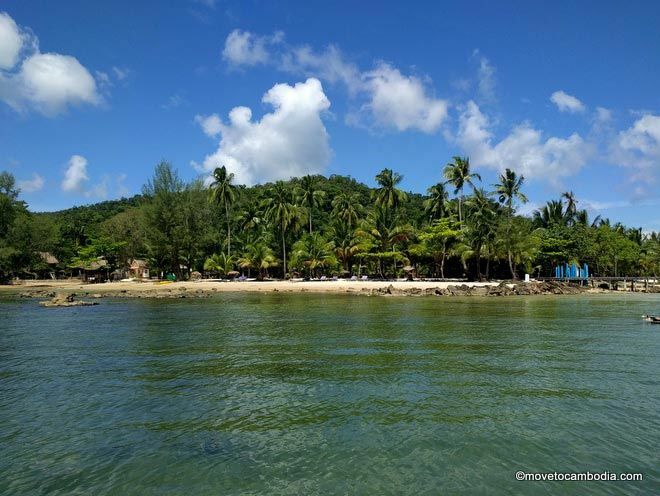 Palm Beach Resort (also called Palm Beach Bungalow Resort) is located next to a small, beautiful beach a few kilometers from Prek Svay Village. Originally, the Palm Beach bungalows were constructed as accommodation for the staff of the notoriously expensive Song Saa Resort, which is directly across the water. But if you don’t want to spend $1,000 per night, Palm Beach Resort offers a much more affordable option. Secluded Palm Beach Resort is the perfect place to unwind on Koh Rong. They have nine types of bungalows, including family bungalows and air-conditioned bungalows. While all of the bungalows at Palm Beach are pretty nice, the ones on the high end of the price range are significantly nicer and probably worth springing for. 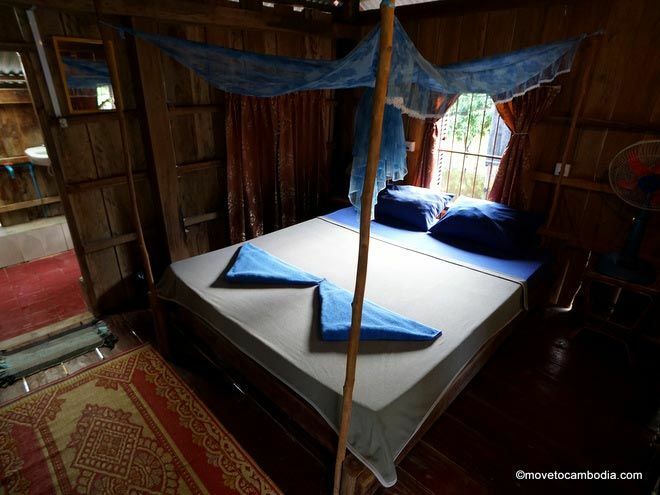 On the lower end, you’ll get a simple wooden bungalow that’s fan-cooled, has mosquito nets, and is exactly like all of the other bungalows on the island. The nicer fan-cooled bungalows have extra touches — real walls, as opposed to untreated wood, wardrobes, artwork — and are slightly bigger. All have ensuite bathrooms with cool-water showers and private balconies furnished with hammocks and chairs. There are several family bungalows that can sleep four to six people. One of Palm Beach’s less expensive bungalows. The two most expensive bungalows have air-conditioning, remote-controlled fans, and cable TV, and one has even been designed to allow a tree to grow in the bungalow itself. When we recently stayed at Palm Beach Resort we were impressed by their attention to detail. The beach is raked several times a day, so it looks much nicer than at other places. 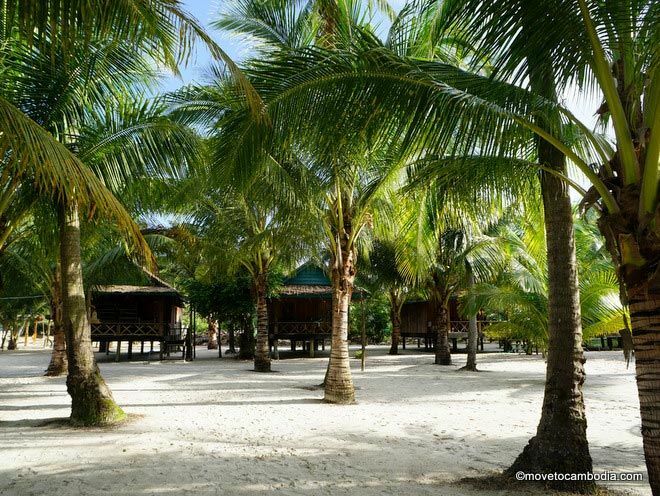 There are hammocks and all types of seating among the coconut trees, and loungers on the beach with thatch umbrellas, as well as a volleyball court on the sand. While the beach is small, there are more luxurious beaches within walking distance. They’ve clearly done a lot to encourage people to stay for extended periods of time. One of Palm Beach’s top-of-the-line bungalows, note the tree growing inside behind the television. Palm Beach Resort has its own restaurant with a small menu of Western and Cambodian dishes. Additionally, a 20 minute walk will bring you to Prek Svay Village, if you’re looking for a more local dining experience.They also have a beachside bar with a full range of cocktails, which is convenient, because you’ll probably end up spending your time at the resort because there’s not much else nearby. Although it’s not a backpacker place, per se, there were quite a few people taking advantage of sunset cocktails and the bar was full until bedtime when we stayed there, with a friendly meet-other-travelers vibe. Electricity is available from 9:30 a.m. through when the bar closes, although when we stayed they left it on all night. And although they have a sign saying ‘No WiFi, please talk to each other,’ they do have WiFi in the restaurant from 6 p.m. until around 1 a.m. when the bar closes. We loved the well manicured beach and coconut grove at Palm Beach. To get to Palm Beach Bungalows, don’t take one of the regular ferries. The resort has its own private boat that goes from their Sihanoukville booking office (near the Golden Lion roundabout) at 1 p.m. every day to Palm Beach and back at 9:30 a.m. Round-trip tickets cost $25. Bookings are available online, either through their Facebook page or on Booking.com or Agoda. In high season, prices are lower on line, but in low season you can get deals by contacting them directly.